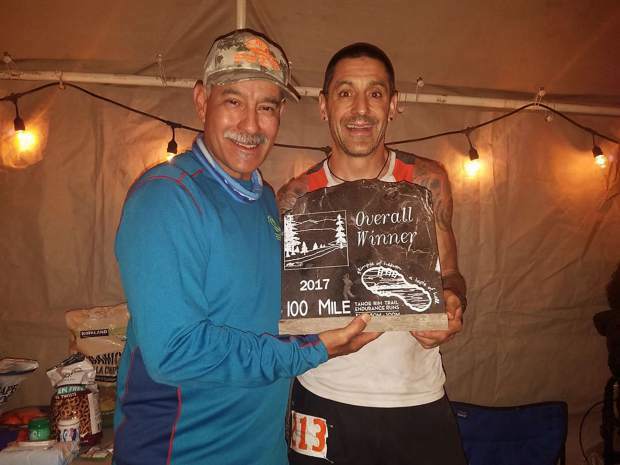 South Lake Tahoe resident Ryan Weibel, right, poses with Tahe Rim Trail Enurance Race director, George Ruiz, after Weibel's victory in the 100 mile portion of the race. His finishing time was 18:29:09. 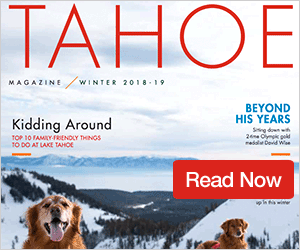 Just finishing a typical 26.2 mile marathon is a feat in itself, but imagine running the distance of four, consecutive marathons in one day — that’s exactly what South Lake Tahoe resident Ryan Weibel did last weekend at the July 15-16 Tahoe Rim Trail Endurance Run’s 100 mile portion. Not only did Weibel finish the race, he won it with a time of 18:29:09. The TRT endurance race is divided into three distances participants can choose to run: a 25 mile, 50 mile or 55K (34 miles) route. According to seven-time race director, George Ruiz, the event has grown to be a well-known destination for endurance athletes and the race sells out every year. Between the three race portions, Ruiz said they had about 550 people participate, with 600 being the race’s cap. 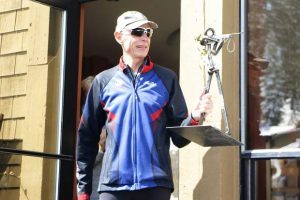 The 44-year-old Weibel said he has participated in other types of non-foot races all over the country, but meeting his wife is what first got him exposed to endurance foot races. “I used to do 24 hour and 100 mile mountain bike races,” Weibel said. “When I met my wife she was training for her first 100 miler. I started running with her after that. My first race was a 50K.” According to Weibel, he had actually run five ultra marathons before taking it easy with a traditional marathon. Weibel explained that after so many miles, it really comes down to being mentally resilient to win. According to Weibel, among other races, he’s won the TRT 50 mile race previously and last summer he won Truckee’s Castle Peak 100K. This year was Weibel’s first shot at the TRT 100 miler. 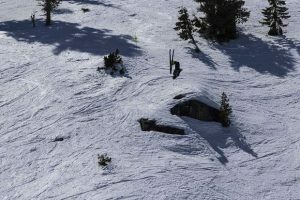 The route taken in the race begins at Spooner Lake, and does two 50-mile loops — one up toward Incline Village, and then another back down toward Spooner. Weibel said since it is such a long race, you really have to be strategic with your speed, stride and when you take time to stop at an aid station. Weibel’s win was pretty significant too since he was up against some skilled competitors, including an Olympic distance runner. 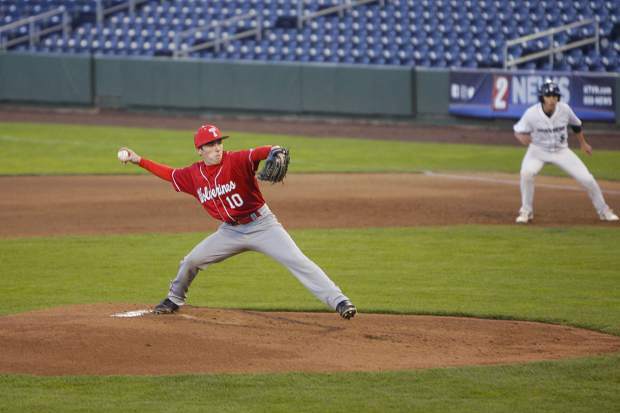 There were also a couple other notable wins from local runners. Lyndsey Bednar, of Stateline, Nev., came in second in the women’s TRT 100 mile race and Rory Bosio, of Truckee, was the 50 mile overall winner. Weibel’s next race will be tackling the Castle Peak 100K again. The race is scheduled for the end of August and Weibel said he’s aiming to repeat his 2016 victory.